Home :: Network Spools & Tools :: Networking Tools :: Southwire Compact Compression Coax Crimp Tool - Cable TV "F"
Southwire Compact Compression Coax Crimp Tool - Cable TV "F"
The ZK-CCF-C1 Compression Crimp Tool securely attaches "F" type connectors to coax cable in one easy step. ZK-CCF-C1 features double-molded handles to provide a comfortable grip and powerful crimping force. 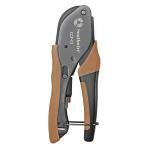 - Compact Compression Coax Crimp Tool - Cable TV "F"